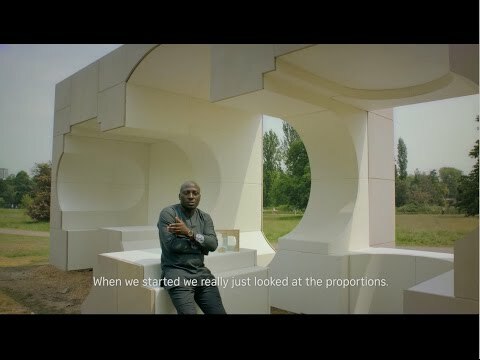 Kunlé Adeyemi’s Summer House was an inverse replica of Queen Caroline’s Temple - a tribute to its robust form, space and material, recomposed into a new sculptural object. With a play on architecture, our design aims to fulfil the simple primary purpose of a Summer House: a space for shelter and relaxation. The design is based on projecting an inverse replica of the historic Queen Caroline's Temple - a tribute to its robust form, space and material, recomposed into a new architectural language. By rotating the Temple's interior space, we expose the structure's neo-classical plan, proportions and form. Using prefabricated building blocks assembled from rough sandstone similar to those used in building the Temple, in contrast with a soft interior finish, our composition generates basic elements of architecture - a room, a doorway and a window - for people to interact with the building, the environment and with one another. The carved out void, homely interior and fragmented furniture blocks create comfortable spaces for people to eat, rest or play - in and around the house - all through summer. Kunlé Adeyemi (born 1976) is a Nigerian architect, urbanist and creative researcher. His recent work includes Makoko Floating School an innovative, prototype, floating structure located on the lagoon heart of Nigeria’s largest city, Lagos. This acclaimed project is part of an extensive research project - African Water Cities - being developed by NLÉ, an architecture, design, and urbanism practice founded by Adeyemi in 2010 with a focus on developing cities and communities. NLÉ is currently developing a number of urban, research and architectural projects; including Rock - Chicago Lakefront Kiosk; Chicoco Radio Media Centre; Port Harcourt and Black Rhino Academy in Tanzania. Born and raised in Nigeria, Adeyemi studied architecture at the University of Lagos where he began his early practice, before joining Office for Metropolitan Architecture (OMA) in 2002. At OMA he led the design, development and execution of several large prestigious projects around the world. Adeyemi is a juror for RIBA’s 2016 International Prize and an Adjunct Associate Professor at the Graduate School of Architecture, Planning and Preservation, Columbia University, New York.